This pendant and its symbolism were created as a key of ascension to the higher realms of reality. At the center, I’ve placed the image of the Biblical burning bush. 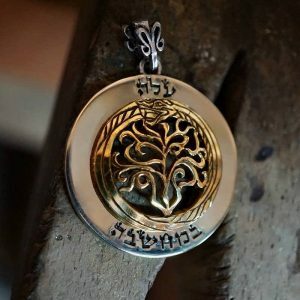 You will be able to notice the Hebrew letter “Shin” which can be found in many ancient amulets and symbolizes the first letter of the phrase “Shomer Ddaltot Israel” – Guardian of the doors of Israel, an ancient remedy for healing and protection. The burning bush symbolizes divinity, sacredness and the realm beyond time and matter. The snake devouring its own own tail is, of course, the ancient symbol of the Ouroboros. A symbol of rebirth, infinity, recreation, and divinity. The ancients used to see the snake shedding its skin and being born “again” and used this symbol to represent recreation, healing and so forth. It was during the vision of the burning bush in the desert, when Moses asked God to give him a sign, to be able to perform a miracle to the people of Israel, and God told him to transform his cane into a snake. The same symbol was used for healing during the wandering through the desert. The two Hebrew words on the pendant are “ALA BA’MAKHSAVA” which can be translated as “rose or appeared in the thought”.